People who really know me know that I am not a reader. It takes quite a bit for a book to grab my attention and I have the attention and interest level of a junior high student. I’ve had plenty of books suggested to me. If I get a few pages into the book and I’m not feeling it, the book makes it way to the “maybe someday, yeah right, pile”. 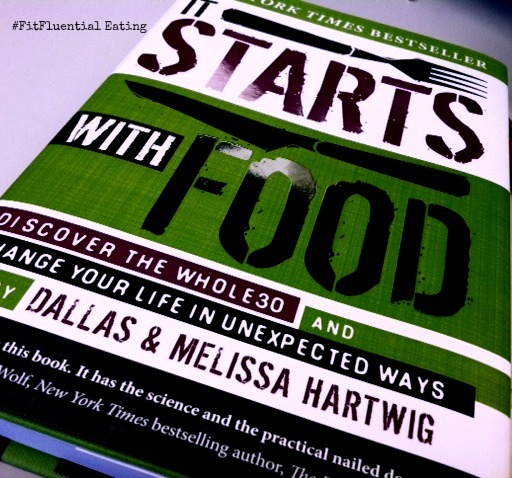 Dallas & Melissa Hartwig’s It Starts With Food came my way a couple of weeks ago and it’s definitely held my attention for the past couple of weeks and hasn’t made it’s way to “that” pile. Now, I haven’t been reading a whole lot lately because I’m just exhausted at night (when I would read) and I’m crashing harder and earlier than normal. But when I do get the chance to read, I am liking what I’m reading. So far I’m on chapter 5 and I’m definitely intrigued by what Dallas and Melissa have to say. Oh yes, most definitely. 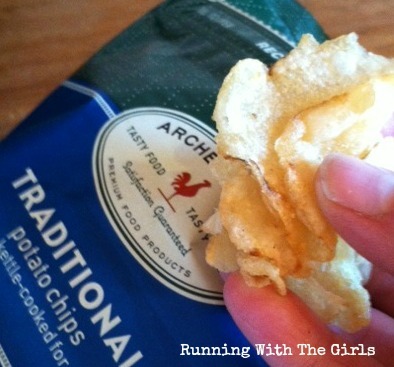 When I’m stressed, I go straight for that bag of chips. “…you will never again be controlled by your food.” I love this! Now, in terms of changing my entire family and the way they eat, I’m not so sure that will work. However, I can definitely make some pretty major changes in what they eat for our family meals and snacks when I’m around. I’m hoping that with the changes I make for them, they will start to see results and begin to crave the whole foods rather than the processed foods they tend to enjoy. Here’s hoping! What does this mean to my existing diet? Good bye chips. Well, at least for 30 days (after I’ve finished reading the book of course!). Perhaps I will find some better substitutions or not even crave chips. Now that will be a miracle! I CAN do this and I’m very curious to see how I feel afterwards. I’ll be posting on my progress and thoughts while reading through this insightful book. Have any of you read it? What are your thoughts? You'll have a wait a bit - I think I'm hold off until after the holidays. Fresh new start for me. I think I need to read that book in all my spare time. ;) I wonder if they have an audio book. I, too, have a chip problem. Maybe I'll find in there I can eat endless supplies of Kale chips. I can only hope! I cannot get on the kale chip train! I've tried... maybe it's because I'm not a fan of chips to begin with (Gasp)... but yeah. If you find a good method, let me know please! This book keeps popping up, I think that's a sign that I need to read it. Curious to see what you think when your done. Mmm..chips. I don't eat me often but I do really like them. I would be interested to hear more about the book. I will be interested to hear more of what you are reading:) I know if I eliminated some things from my diet, I would feel better and my skin would look better, but so far I haven't made the plunge. Yikes! I haven't read it, but I love reading about whole foods and nutrition, and the connections to how we feel and live. Sounds like a good one! For me it's sugar, not chips, that is hard to kick. I'm intrigued! I'm definitely more health-conscious when I'm not stressed (or at the point of being very hungry, when I tend to make rash decisions). Never heard of it but I am intrigued as well! Can't wait to see your progress! Someone told me that the studies they cite in the book are all second and third tier publications, suggesting that the studies had been rejected by the more respected scientific journals. I don't know if that's true or not. I have done Whole 30, and while I will grant that it definitely peels off the weight, I think that eliminating ANY food group from your diet would do the same thing. Vegetarians also undergo weight loss in transition. I don't think it is sustainable, and that's where these folks miss the mark. On the other hand, anything that helps make people more aware of what they're eating is a plus. I haven't read it but it sounds interesting! I don't really eat chips often but it would be hard to give them up completely! I am really curious by that and a couple other food books I have heard about lately since I am trying to be healthier and eat better. However, I have not bit the bullet and bought any yet as I am stupidly spending too much time blogging to read. Sounds like a super interesting book!